Hi guys. 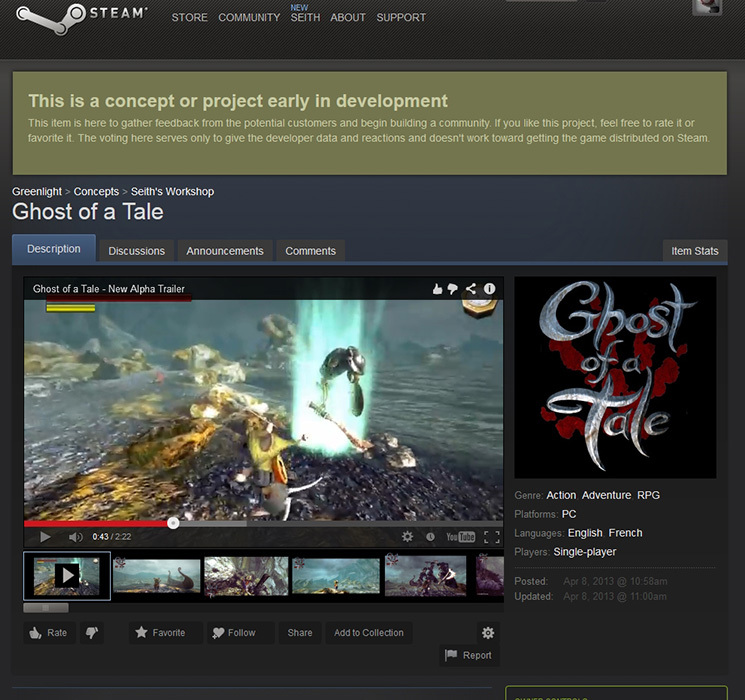 “Ghost of a Tale” (or GoaT for short) now has a Greenlight page in the Concepts section of Valve’s Steam. You can go there and express your interest if you’d like to. Steam seems like a nice venue to distribute the game when it’s done. Although it won’t be the only one (and Steam does not require exclusivity). Per request, here’s a full-size Facebook cover picture (851*315 pixels) that you can use to spread the word about “Ghost of a Tale”! Yay! Kotaku just mentioned “Ghost of a Tale” (thanks Luke)! Will it help the campaign, which in its second day has virtually NO traction at all? Let’s hope so! At last the Indigogo page for “Ghost of a Tale” is up! You can find it HERE! And as promised, here’s the new video that shows a little gameplay. Hopefully it gives a good idea of what the game could be. So if you think this game should exist one day, then please go to the campaign page and help spread the word! And if about a week from now you hear an earth-shattering thud, do not be alarmed; it’ll only mean the campaign has crashed and burned to the ground. Or maybe it’ll be a soft “flop” with no sound at all…?